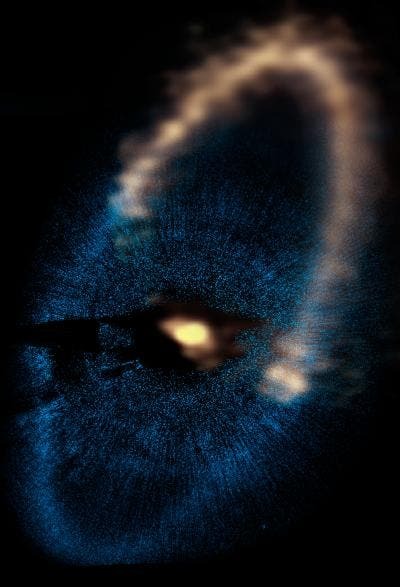 The discovery, which helped resolve a controversy among earlier observers of the system, was made possible by high-resolution images of a disk, or ring, of dust orbiting the star, about 25 light-years from Earth. The ALMA images show that both the inner and outer edges of the thin, dusty disk have very sharp edges. That fact, combined with computer simulations, led the scientists to conclude that the dust particles in the disk are kept within the disk by the gravitational effect of two planets — one closer to the star than the disk and one more distant. Their calculations also indicated the probable size of the planets — larger than Mars but no larger than a few times the size of the Earth. This is much smaller than astronomers had previously thought. In 2008, a Hubble Space Telescope (HST) image had revealed the inner planet, then thought to be larger than Saturn, the second-largest planet in our Solar System. However, later observations with infrared telescopes failed to detect the planet. That failure led some astronomers to doubt the existence of the planet in the HST image. Also, the HST visible-light image detected very small dust grains that are pushed outward by the star's radiation, thus blurring the structure of the dusty disk. The ALMA observations, at wavelengths longer than those of visible light, traced larger dust grains — about 1 millimeter in diameter — that are not moved by the star's radiation. This clearly revealed the disk's sharp edges, which indicate the gravitational effect of the two planets. "ALMA may still be under construction, but it already has proven to be the world's most powerful telescope for observing the Universe at millimeter and submillimeter wavelengths," said Stuartt Corder, of the National Radio Astronomy Observatory, a member of the observing team.